The constellation Ophiuchus. Roll mouse over to see labels. Ophiuchus is a large equatorial constellation which appears highest in the midnight sky in the months around June. It lies just north of the Milky Way and encompasses a particularly rich part of the galaxy. Our sightline towards the center of the galaxy lies not far away, in the neighboring constellation of Sagittarius. This means that Ophiuchus is exceptionally rich in globular clusters, which mostly lie in spherical swarm around the galaxy's center. 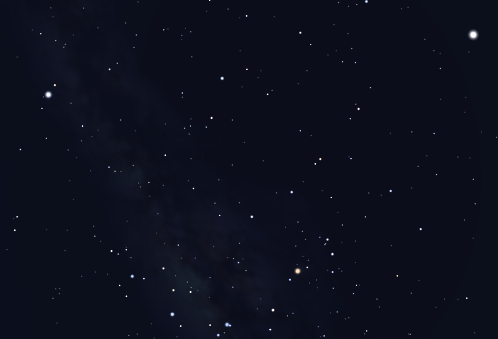 Ophiuchus alone contains no fewer than 16 that are brighter than tenth magnitude, second only to Sagittarius which contains 18 clusters of the same brightness. Although Ophiuchus is not among the twelve traditional constellations of the zodiac, the Sun passes through its southern extremities for around two weeks each year in early December. Ophiuchus is the only constellation other than the traditional twelve that the Sun passes through, making it effectively a thirteenth zodiacal constellation. 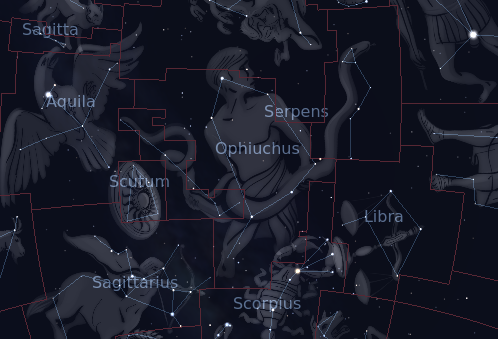 On sky charts, Ophiuchus is depicted as a man holding a serpent, often identified as Asclepius, the god of medicine. The figure's brightest star is named Rasalhague, Arabic for ‘the head of the serpent collector’. Ophiuchus contains the following Messier objects: M9, M10, M12, M14, M19, M62, M107. The following constellations neighbor Ophiuchus: Aquila, Hercules, Libra, Sagittarius, Scorpius, Serpens Caput, Serpens Cauda.